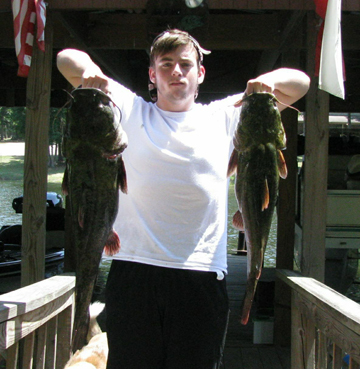 August 8, 2013 – Had a great top water bite – total bass 9 with biggest being 4 lbs. 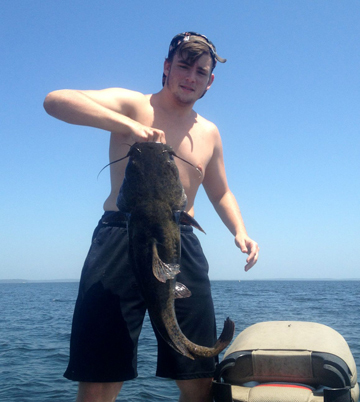 Had 3 blowups and one was a really nice bass but came unbuttoned. Action over at 9:00 AM. Best baits Zara Spook (white/silver) and Chug Bug in silver and bone finish. 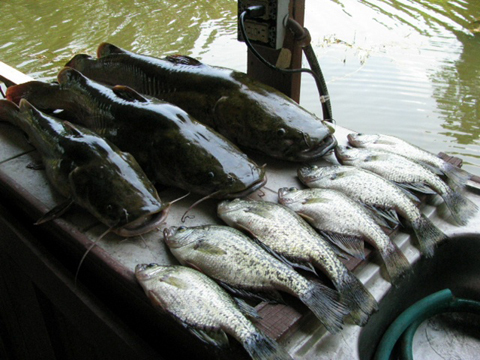 Fished nickle jigging spoons for 42 yellow bass, 6 crappie and I caught a 15-lb catfish (18- to 22 feet)..
August 9, 2013 – Had three bass on topwater but had one really big bass hit bait twice but didn’t get hooked up. I think it hit with a closed mouth but it was a dandy. Topwater bite was very slow with almost no action of bait fish on top. Worked jigging spoons for 8 really nice crappie and then we caught a 15-7, 13 and 6 lb catfish .. all on the jigging spoons. My grandson caught the big one and was he excited. ‹ 2013 Ocean Hero Awards Youth Winners!